NY PRICING AT THE EXACT SAME TIME: $1324.90 ??? NY PRICING AT THE EXACT SAME TIME. NOTICES FILINGS TODAY FOR APRIL CONTRACT MONTH: 179 NOTICE(S) FOR 17,900 OZ. In silver, the total open interest ROSE BY AN APPRECIABLE 1913 contracts from 188,145 UP TO 190,058 WITH THE HUGE RISE IN PRICE THAT SILVER UNDERTOOK WITH YESTERDAY’S TRADING (UP 38 CENTS).HOWEVER WHEN YOU COMPARE WITH THE MAMMOTH INCREASE IN GOLD OI YOU CAN BE COMFORTED THAT THE BANKS ARE QUITE RETICENT TO SUPPLY ANY PAPER. NO DOUBT THAT WE LOST SOME PAPER PLAYER LONGS TO EFP’S BUT THAT WAS QUICKLY REPLACED WITH NEWBIE LONGS AGAIN TAKING ON THE BANKERS. AS SOON AS SILVER BROKE RESISTANCE AT $17.25 THEY POURED ON THE JUICE WITH RECKLESS ABANDON. SOME LONG SPECS EXITED WITH A PAPER PROFIT. In ounces, the OI is still represented by just UNDER 1 BILLION oz i.e. 0.962 BILLION TO BE EXACT or 137% of annual global silver production (ex Russia & ex China). In gold, the open interest ROSE BY AN UNBELIEVABLE 22,957 CONTRACTS WITH THE HUGE RISE in price of gold ($16.95 GAIN YESTERDAY .). The new OI for the gold complex rests at 537,503.
we had: 179 notice(s) filed upon for 17,900 oz of gold. IN THE LAST 32 TRADING DAYS: GLD SHEDS 22/61 TONNES YET GOLD IS HIGHER BY $81.25 . RESULT: A HIGHER OI AT THE COMEX,(BUT MUCH SMALLER THAN GOLD) WITH A HUGE PRICE INCREASE. Now it is China’s turn to weigh in on the North Korean situation as they are trying to avoid provocations. Russian states that sanctions have been exhausted. The Aramco public offering will be a huge geopolitical game of thrones. China is turning towards Saudi Arabia and they will be willing to pay higher than real worth in order to come closer to this large oil country. iii)China is planning a crackdown on cryptotocurrency exchanges: they are calling it illegal funding!! i a)All options with respect to North Korea are on the table is the official response from Trump. vi)Now authorities warn that bridges are not safe as they start to crumble to the weight of the floodwaters. The total gold comex open interest ROSE BY A HUMONGOUS 22,957 CONTRACTS UP to an OI level of 537,503 WITH THE HUGE GAIN IN THE PRICE OF GOLD ($16.5 GAIN / YESTERDAY’S trading). This time the bankers did supply the necessary gold short paper when newbie longs took on our criminal bankers realizing that the geopolitical climate in the states was getting to their liking as Trump threatened to close government unless he got his wall plus the two dovish speeches by Yellen and Draghi at Jackson Hole, THE FLOODING OF HOUSTON , and the firing of those North Korean missiles. Once gold pierced the 1300 dollar resistance level, the bankers realized the trouble they were in but had no choice but to supply all the necessary comex paper short to satisfy the longs . The bankers looked for divine intervention but got none. The active August contract LOST 52 contract(s) to stand at 615 contracts. We had 38 notices filed YESTERDAY so we LOST ONLY 14 contracts or an additional 1400 oz will NOT stand at the comex and 14 EFP’s were issued in August which entitles the long holder to a fiat bonus plus a futures contract and most probably that would be a London based forward. The non active September contract month saw it’s OI LOSS OF 9 contracts DOWN to 1158. The next active contract month is Oct and here we saw a HUGE LOSS of 657 contracts DOWN to 51,147. The very big active December contract month saw it’s OI gain 13,990 contracts up to 417,701. RESULT: A GOOD SIZED INCREASE IN OI WITH A HUGE GAIN IN PRICE (BUT LESS OF A PERCENTAGE BASIS THAN GOLD). WE HAD A SMALL TRANSFER OF LONGS FOR ANOTHER PHYSICAL DELIVERY PRODUCT PROBABLY A LONDON FORWARD. We are now in the next big non active silver contract month of August and here the OI LOST 70 contract DOWN TO 0. We had 70 notice(s) filed yesterday. Thus we GAINED 0 contract(s) or an additional NIL oz will stand for delivery in this non active month of August and AGAIN zero EFP’s were issued for the August contract month. Please note that in gold we continually see EFP’s issued throughout the delivery month but not in silver!! HOWEVER WE DID HAVE A SMALL NUMBER OF LONGS IN SEPTEMBER RECEIVE EFP’S IN EXCHANGE FOR THEIR DEPARTED LONG POSITIONS. THESE GUYS RECEIVE A FIAT BONUS PLUS A DELIVERABLE PRODUCT ON ANOTHER EXCHANGE. The next active contract month is September (and the last active month until December) saw it’s OI fall by 11,433 contacts down to 28,784. The next non active contract month for silver after September is October and here the OI GAINED 90 contacts UP TO 842. After October, the big active contract month is December and here the OI GAINED by 12,860 contracts UP to 144,535 contracts. Today, 0 notice(s) were issued from JPMorgan dealer account and 0 notices were issued from their client or customer account. The total of all issuance by all participants equates to 179 contract(s) of which 0 notices were stopped (received) by j.P. Morgan dealer and 0 notice(s) was (were) stopped/ Received) by j.P.Morgan customer account. To calculate the initial total number of gold ounces standing for the AUGUST. contract month, we take the total number of notices filed so far for the month (4804) x 100 oz or 480,400 oz, to which we add the difference between the open interest for the front month of AUGUST (615 contracts) minus the number of notices served upon today (179) x 100 oz per contract equals 523,800 oz, the number of ounces standing in this active month of AUGUST. Over a year ago the comex had 303 tonnes of total gold. Today the total inventory rests at 270.17 tonnes for a loss of 33 tonnes over that period. Since August 8/2016 we have lost 84 tonnes leaving the comex. However I am including kilobar transactions and they are very suspect at best. The total number of notices filed today for the AUGUST. contract month is represented by 0 contract(s) for NIL oz. To calculate the number of silver ounces that will stand for delivery in AUGUST., we take the total number of notices filed for the month so far at 1248 x 5,000 oz = 6,240,000 oz to which we add the difference between the open interest for the front month of AUGUST (0) and the number of notices served upon today (0) x 5000 oz equals the number of ounces standing. Thus the FINAL standings for silver for the AUGUST contract month: 1248 (notices served so far)x 5000 oz + OI for front month of AUGUST(0 ) -number of notices served upon today (0)x 5000 oz equals 6,240,000 oz of silver standing for the AUGUST contract month. This is extremely high for a non active delivery month. Silver is being constantly demanded at the silver comex and we witness again the amount of silver increases daily right from the get go. At this point in the delivery cycle last year on August 29/2016 we had 23,748 contracts standing vs this yr at 28,784. JUDGING FROM WHAT WE HAVE BEEN EXPERIENCING IN SILVER, THIS WEEK’S FIRST DAY STANDING WILL BE A DILLY!! FRIDAY’S CONFIRMED VOLUME OF 158,092 CONTRACTS WHICH EQUATES TO 790 MILLION OZ OF SILVER OR 113% OF ANNUAL GLOBAL PRODUCTION OF SILVER EX CHINA EX RUSSIA). IN OUR HEARINGS THE COMMISSIONERS STRESSED THAT THE OPEN INTEREST SHOULD BE AROUND 3% OF THE MARKET. 1. Central Fund of Canada: traded at Negative 7.0 percent to NAV usa funds and Negative 6.9% to NAV for Cdn funds!!!! Note: Sprott silver trust back into NEGATIVE territory at -0.43%/Sprott physical gold trust is back into NEGATIVE/ territory at -0.55%/Central fund of Canada’s is still in jail but being rescued by Sprott. *LAST 160 TRADING DAYS: A NET 21.91 TONNES HAVE NOW BEEN ADDED INTO GLD INVENTORY. *FROM FEB 1/2017: A NET 5.10 TONNES HAVE BEEN ADDED. This morning the price of gold has rallied to its highest point since the Trump’s election. North Korea’s firing of a missile over Northern Japan which landed in waters off Hokkaido in the Pacific, has sharply escalated tensions in the Korean peninsula and in Asia. This latest move by Kim Jong Un was intended to show that an attack on Guam is possible at any time, according to North Korea’s Mun-hwan. There had previously been concern that the war of words between Trump and Kim Jon-Un would result in others getting caught in the crossfire. This was confirmed this morning when Japan was made a clear target. Immediately after the missile launch was detected the Japanese government’s J-Alert system interrupted radio and TV to warn citizens of the possible missile and urged them to take refuge in solid buildings or underground shelters. Bullet train services were temporarily halted and warnings went out over loudspeakers in towns in Hokkaido. South Korea’s air force has staged a live-fire drill simulating the destruction of North Korea’s leadership. Earlier this morning four South Korean fighter jets bombed a military firing range north of Seoul after President Moon Jae-in asked the military to demonstrate capabilities in a show of strength to North Korea. North Korea refers to these missile launches as ‘tests’. But they are more than tests of the equipment, they are also tests on the patience, nerves and self-control of those who feel threatened by Kim Jong-Un. Observers and surrounding countries believe this saber-rattling is growing ever more serious and dangerous by the day. Trump is also left red in the face after his comments that Kim Jong Un “is starting to respect us.” Yet another idiotic comment from the current incumbent of the White House. Fear in the markets has been expressed by the climb in price of gold and the ongoing support for the Japanese Yen, Swiss Franc and US Dollar. While the yen has risen in the short term, the notion that it is a ‘safe haven‘ in the real sense of that term – as a medium and long term hedge for investors – is inaccurate. This is clearly seen in the table above and the chart below which show that the yen has fallen nearly 10% per year versus gold in the last 15 years. Gold rose in yen prior to the crisis from 2002 to 2007 and again during the height of the crisis from 2009 to 2012. Seeing as Japan is at risk of a nuclear attack and being sucked into a war – wars are expensive things – the yen is actually vulnerable and will likely fall in the coming months. The rise in the price of both gold and silver is expected given the events of last night, however they do not come without support elsewhere. The outcome of Jackson Hole and growing concern over the looming US debt ceiling have been providing growing support for the climb in gold and silver. Currently there are two major drivers for the price of gold, both of them related to President Donald Trump himself. These are: US political instability and tensions in Asia including with North Korea. Following Trump’s election markets had expected Trump’s plans for fiscal stimulus to do great things for the economy. A planned $500 billion infrastructure spending program was expected to lead to strong US economic expansion, higher interest rates and a more robust dollar. However, nothing has materialised and Trump now has the problem of a potential government standoff as the $20 trillion debt ceiling issue looms in September. Many might argue that Trump inherited these huge economic challenges that will likely lead to political instability. But, one problem he has definitely made worse and arguably added to (in the short-term) is that of North Korea. A major difference with the North Korea problem is that for the first time in modern history the US has a president who is happy to be confrontational and threatening. He does not appear to want to be conciliatory and work to find a multi-lateral solution. With this in mind it is near impossible for investors to know how this will end. At the time of writing there has been no official response from the White House or tweets from President Trump. How the situation with North Korea will unfold relies heavily on what happens in Washington. No doubt, If Trump decides to tweet and escalate the matter the situation will become even messier prompting a sharp sell off in risk assets. Once again the short-term support for gold is being solidified by uncertainty. 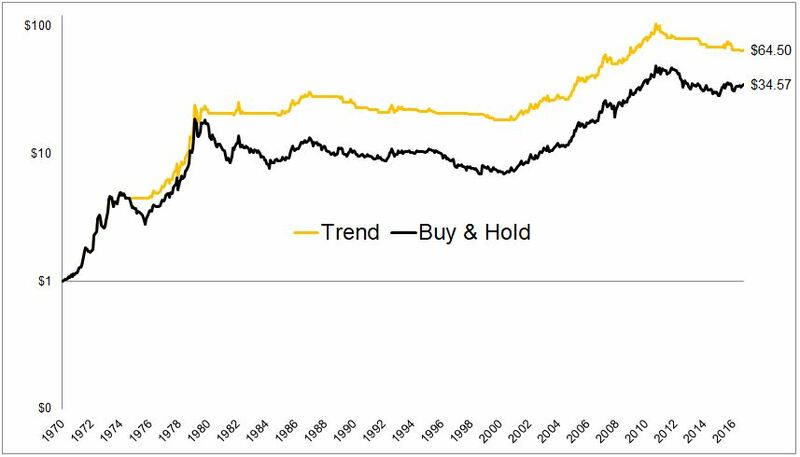 This combined with the long-term support that is driven by the irrevocable damage governments have done to our markets and currencues, means that we are left with a strong basis for an ongoing climb in the gold price. Investors are turning to gold today because one of the world’s most advanced economies is under threat by one of the last closed-dictator regimes. The situation will be helped or hindered by others in the western world who are also concerned for their own country’s safety. We are very much on the brink of something which could affect lives for generations to come, much like the last two major wars that dragged every corner of the globe into them. 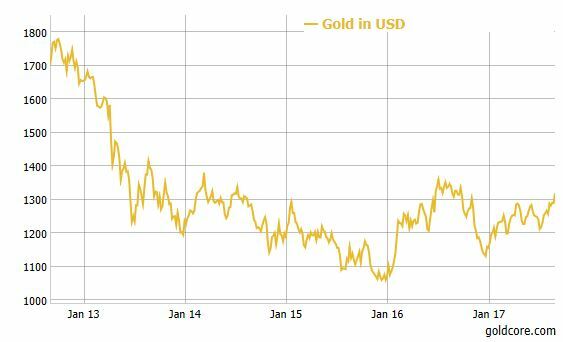 In previous scenarios when countries’ safety and sovereignty have been under threat, gold has acted as a safe haven for those who are concerned about the safety of their assets, currencies and wealth. They have invested in gold, safe in the knowledge that it cannot be deleted by a cyber attack or told it cannot be used when they cross borders. They know that it is the ultimate safe haven. The market reaction to events overnight shows again that diversification is key. Gold should be treated as a currency and added to a balanced, diversified portfolio to ensure financial insurance in the coming months and years. Central banks forbid independent audits of their gold reserves, gold fund manager Egon von Greyerz notes today in an interview with King World News, because much of that gold is either missing entirely or impaired by leases and swaps. For example, von Greyerz adds, the gold supposedly still being kept in the United States by Germany’s Bundesbank rather than repatriated to Germany is probably long gone. Of course there may be other explanations, such as that the Trump administration wants dollar devaluation to gain advantages for U.S. industry because gaining advantage through tariffs would violate international agreements. Or maybe governments that want the gold price suppressed are at last running out of more metal than they care to lose. No one who doesn’t know how governments themselves are doing their own secret trading today knows for sure. China is planning a crackdown on cryptotocurrency exchanges: they are calling it illegal funding!! Earlier this year, Chinese digital currency exchanges temporarily halted customer withdrawals to upgrade their AML controls at the behest of financial regulators. The halt, which lasted for months, caused a temporary chill in the local bitcoin market, causing China to forfeit its position as the world’s largest bitcoin market. Now, Chinese regulators have signaled that they intend to stage a similar crackdown on initial coin offerings, the latest blockchain-related investing craze. According to CoinDesk, draft legislation meant to curb so-called “illegal fundraising” includes a provision that targets ICOs. Here’s more from CoinDesk (translation theirs). According to CoinDesk, the draft would require the government to establish an interdepartmental committee to combat illegal fundraising. It also clarified that participants of illegal fundraising would be responsible for their own losses. The release of the draft legislation follows widespread outrage directed at cryptocurrency-related scams. Last month, several college graduates in Tianjin, China were found dead after being imprisoned and assaulted by members of a pyramid-selling organization. Two Chinese laws presently govern how criminal courts handle unlawful fundraising. According to CoinTelegraph, the crime of illegally absorbing public deposits carries a maximum penalty of 10 years of imprisonment. The crime of fund fraud, meanwhile, carries a maximum sentence of life in prison. Now the question is, if such heavy-handed penalties are tied to the law currently under consideration, will the law have a chilling effect on the ICO market? Or will it successfully eliminate fraud and abuse? According to a team of analysts at Pitchbook, ICO have raised more than $1 billion this year, and are expected to raise as much as $1.7 billion. Earlier this month, the SEC ruled that tokens produced in ICOs meet the definition of a security, and therefore must be registered with the commission. Though exactly how ICOs will be regulated in the US remains somewhat vague. The prices of Bitcoin has exploded overnight, surging over 6% to a new record high above $4600 as demand from South Korea and Japan spurred more safe haven buying as gold and Treasury bond prices rose following North Korea’s most provocative missile launch yet. 30 SNB (Swiss National Bank) still intervening again in the markets driving down the SF. It is not working: USA/SF this morning 0.9442 as the Swiss Franc is still rising against most currencies. Euro vs SF is 1.1368 well above the floor set by the Swiss Finance Minister. Thomas Jordan, chief of the Swiss National Bank continues to purchase euros trying to lower value of the Swiss Franc. – Masayoshi Kichikawa, chief strategist at Sumitomo Mitsui. Following last night’s “unprecedented” North Korea missile launch over Japan, which was a clear taunt to Donald Trump, the biggest moves this morning are not to be found in South Korea, where the Kospi index closed Tuesday just 0.2% lower after falling as much as 1.6% as local BTFD spirits were ignited late in the session, or in Japan where the Nikkei pared much of its losses to end down 0.5% as the BOJ bought a few billion more in ETFs (but not before hitting a 4 month low), but across developed markets where the Euro finally surged above the “profit crushing” psychological barrier of 1.20 for the first time since January 2015, sending European stocks reeling to 6 month lows as exporters, mostly in Germany, were slammed. The VIX was up over 20% in early trading, jumping 2.42 vols to 13.74. None other than chancellor Angela Merkel commented on the Euro this morning, and when asked about the impact of the euro’s rise on Germany’s trade surplus, says it’s a simple fact that the euro’s exchange rate has an impact on terms of trade. “I don’t decide about the euro’s exchange rate”: Merkel says at news conference in Berlin. Clearly that’s Mario Draghi’s responsibility. “Personally, I don’t see the trade surplus as so dramatic” she added. We’ll see if German investors agree. “The market is still digesting Draghi’s comments from Jackson Hole and the U.S. outlook is looking difficult with concerns around the budget and a looming shutdown,” said Esther Maria Reichelt, an FX strategist at Commerzbank in Frankfurt. Meanwhile, in a broader move, world stocks tumbled and safe-haven assets jumped on Tuesday on worries the North Korea situation could devolve into an all out military conflict. S&P futures fell as much as 0.7% to the lowest in more than seven weeks. The European STOXX 600 index fell more than 1% to a six-month low. North Korea military tensions also sent both European, Japanese and US Treasury yields tumbling, with the 10Y Bund down to 0.33%, the lowest in two months, the 10Y Treasury tumbling as much as 2.10%, the lowest in 10 months, and the benchmark JGB sliding back to Japan’s target of 0.0%. The risk off tone has spurred a broad flight into other safe-havens, with JPY, CHF and gold surging higher. Meanwhile, equities dropped and volatility surged across the globe in classic risk-off moves, with U.S. stock futures also tumbling, down 17 at pixel time. Japan called Kim Jong Un’s latest provocation an “unprecedented, grave and serious threat.” Gold surged to the highest this year, while the Swiss franc and the yen were the best-performing major currencies. In Europe, the Stoxx Europe 600 Index sank 1.5% to the lowest in almost seven months, as the EURUSD crossing 1.20 has spooked investors, worried that exporter profits are about to be wiped out. In the UK, the U.K.’s FTSE 100 Index declined 1.3% to the lowest in 16 weeks on a closing basis ahead of grueling, and chaotic, Brexit negotiations. Germany’s DAX Index decreased 1.7% to the lowest in more than five months, led by sliding exporters. Tuesday’s launch thrust the confrontation between the U.S. and North Korea back to the fore after the hermit kingdom had been praised by Secretary of State Rex Tillerson last week for its “restraint.” Tillerson said that North Korea hadn’t carried out “provocative acts” since the UN Security Council imposed new sanctions earlier this month, and that Pyongyang’s temperance might lead to negotiations “in the near future.” Kim Jong Un last tested a missile on July 28. The dollar was down 0.6 percent at 108.63 yen after hitting its lowest level since mid-April despite Japan’s proximity to North Korea. Also the safe-haven Swiss franc strengthened, with the dollar falling 0.6 percent to a one-month low against the Swiss currency. Across EM, Predictably, Russia’s ruble (due to ongoing Harvey-related oil price woes) and South Korea’s won (for obvious reasons) led losses among emerging-market currencies after North Korea fired a ballistic missile over Japan on Tuesday, damping appetite for riskier assets. The Ruble falls 0.6% against dollar, most among 24 major peers tracked by Bloomberg as oil price weakens 2nd day. The South Korean won fell the most in 2 weeks, even as the Kospi wiped out most trading losses to close only 0.2%. Meanwhile, in its now traditional mirror response to the sliding dollar, the Yuan climbed for the 10th consecutive day, rising above 6.60 to a new 14-month high. Both onshore and offshore yuan extend gains against dollar to beyond 6.60 and to strongest for both since June 2016; in onshore markets, the CNY was up 0.14% at 6.5920 vs USD, climbed 0.7% overnight, the most since Jan. 17, after the PBOC strengthened the fixing for a second day to 6.6293 from 6.6353. 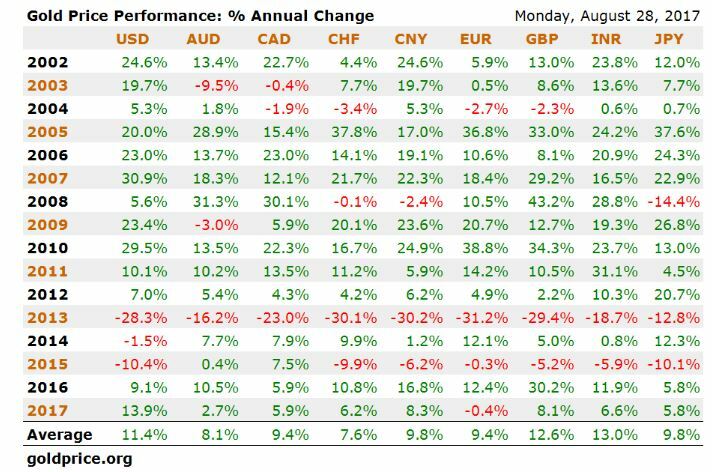 The Yuan was the best performer among 11 Asian currencies tracked by Bloomberg over past month, gaining 2.1% vs U.S. dollar. In rates, bund futures opened higher and extended the recent rally, with 30y yields breaking below 1.10%. US Treasuries outperformed, with price action pointing to stops on the break below 2.10%, the lowest level since mid-November. Curves bull flatten as swap spreads snap wider, in typical risk-off fashion after North Korea fires missile over Japan. Germany’s 10-year yield decreased five basis points to 0.33 percent, the lowest in two months. Britain’s 10-year yield declined six basis points to 0.992 percent, the lowest in almost 11 weeks. Meanwhile, gold prices jumped 0.85% to $1,321 an ounce, hitting its highest level in more than nine months and rising for a third straight session. The metal also drew support from uncertainty surrounding the Trump administration after remarks last week raised fears of a government shutdown. Crude oil bounced back on the back of supply disruptions in Colombia and Libya, a day after U.S. crude futures dropped on worries that refinery shutdowns caused by flooding could boost inventory. WTI crude futures rose 0.26% to $46.69 a barrel after falling to as low as $46.15 in the previous session. Gasoline price, which surged as much as 7 percent to a two-year peak of $1.7799 a gallon on Monday, traded at $1.7263 in early Tuesday trade as storm Harvey picked up strength again after inundating refineries along the Texas coast. Today’s economic data include Conference Board Consumer Confidence Index for August. Bank of Montreal, Bank of Nova Scotia, Best Buy and H&R Block are among companies reporting earnings. Tensions on the Korean peninsula rises after N.Korea fires a missile over Japan. Risk off tone spurs flow into safe-havens with JPY, CHF and gold surging higher. Kim Jong Un’s rattled Asian markets as the U.S. and its allies weighed a response to Kim Jong Un’s latest provocation. South Korean President Moon Jae-in ordered a show of force in response to North Korea’s ballistic missile, with four F-15K jet fighters conducting bomb-dropping drills. Tropical Storm Harvey drifted into the Gulf of Mexico, poised to recharge before crashing ashore again Wednesday on the Texas-Louisiana border. gains following the enhanced liquidity auction for super-long JGBs in which the b/c declined from prior. Portuguese 10Y are wider by 8.1bps, while Italy is wider by 5.1bps against its German counterpart. In FX, Reports that North Korea had fired an intermediate range missile over Japan prompted safe-haven flows during Asia-Pac trade, with USD/JPY dropping below 109.00 before stabilising, as markets await a clear response from the UN, Japan and US President Trump. Bids are said to be building around 108.50 but IFR note that Japanese institutional investors are not committed to buying the dips in the pair. There are not any huge option expiries today although there are strikes at 108.35-50 (430mln) and 109.00 (282mln). EUR/USD has risen to its highest level since Jan’15 after tripping stops above 1.20. Some also suggest that the rise in EUR has been due to Draghi neglecting to talk down the currency in his Jackson Hole speech on Friday. Additionally, cross related buying has been observed in EUR/GBP, which is currently testing 93.00 to the upside, further resistance lies at 93.65 (Oct’16 high). The CHF benefitted from safe haven demand following the missile test with USD/CHF dropping to 0.9500 before finding some support at the level. Cable has been relatively unperturbed by the North Korean missile launch and has been holding around the 55DMA of 1.2934. Comments from the latest round of Brexit negotiations have failed to provide the pair with a catalyst for a move in either direction as talks continue between UK Brexit Secretary Davis and EU Chief Negotiator Barnier. nearly 2 years. Crude prices off worst levels with WTI up 0.6% to approach USD 47.00 to the upside. Looking at the day ahead, there is the Conference Board consumer confidence index for August and the June Case-Shiller house price indices. The bank holiday in the UK yesterday and a damp squib of a Jackson Hole on Friday meant that markets were a bit quiet yesterday although news of another ballistic missile launch by North Korea, only this time over Japan, has seen activity pick up a bit overnight. Late last night reports emerged that North Korea had fired several ballistic missiles including one that flew over Japan(Northern island of Hokkaido) and eventually landed in the Pacific Ocean with no reports of damage. Japan’s PM Abe said “a missile passing over Japan is an unprecedented and serious threat” and has asked the UN Security Council to hold an emergency meeting. Abe also said that he has spoken to President Trump and agreed to increase the pressure on North Korea. Markets in Asia broadly sold-off following the news with the Nikkei (-0.61%), Kospi (-1.13%), ASX 200 (-0.87%) and the Hang Seng (-0.40%) all still in the red as we type. The Yen (+0.39%) and Gold (+0.48%) have firmed while US equity futures are down half a percent. So once again geopolitics is front and centre for markets at the start of a new week. In terms of the rest of the week for the benefit of those in the UK out yesterday we’ve included the remainder of the week ahead at the end again. Payrolls and PCE inflation data highlight the back-end of the week but one event worth keeping an eye on today is the slated four-week T-Bill auction in the US given that the maturity lines up nicely with the debt ceiling deadline of September 29th that Treasury Secretary Steven Mnuchin called “critical”. It’ll be interesting to see what the demand is given some of the selling pressure in that part of the curve last week. For what it is worth a fairly packed day of Treasury auctions yesterday passed without any issues for the bond market. Back to yesterday where the main price action came in the commodity complex and specifically in energy markets in reaction to the awful flooding in the state of Texas following Tropical Storm Harvey. The latest update is that around 30 inches of rain has already fallen but the suggestion is that we could see double that by the end of the week. In terms of the movers the standout was Gasoline which initially surged well over +6% at the open before paring that move as the day progressed but still finished up +2.74% and at the highest level in 4 months. It has extended that move this morning too to be up another +1.57%. The huge flooding hit the supply side of the equation hard with a number of key pipelines closed and over 2 million barrels of crude and condensate capacity in the state of Texas shutdown. Royal Dutch Shell and Exxon Mobil were among those to shutdown plants. On the other hand, WTI Oil fell -2.72% and the most in 7 weeks reflecting the huge drop off in crude oil demand. This morning, WTI has recovered some losses to be +0.52%. It still appears to be far too early to assess the economic impact of the damage caused by Harvey but Bloomberg reported yesterday that costs could surpass $100bn. To put it in perspective Katrina – which was the most expensive hurricane to hit the US – cost nearly $120bn and Sandy cost about $75bn. Based on the experiences of prior hurricanes DB’s Brett Ryan has just published a note looking at the potential economic impacts from Harvey. He noted that Harvey could potentially drag on 2H real GDP growth by c.20bp mainly through disruption to exports, but the timing of these disruptions are difficult to be precise. Notably, some of the hit to economic growth will likely be offset by a boost to construction spending as rebuilding efforts get under way. Hence, the net impact will not likely affect the overall trajectory of the economy. So while energy stocks closed down, gains for the more defensive sectors helped US equity markets broadly close flat. The S&P 500 ended +0.05% and the Dow -0.02%, with listed refiners based away from Texas up c.9%. Prior to this, markets in Europe finished a tad weaker albeit on thin volumes. The Stoxx 600 closed -0.48%. A late afternoon surge for the Euro didn’t help with the single currency adding to Friday’s gains by closing up +0.46% and at the highest (1.1979) since January 2015. Away from that both Treasuries (10y -1bp yesterday and -3bp this morning) and significantly Gold (+1.5%) – which passed $1300/oz for the first time since November – were well bid which seemed to reflect a slight risk off tone but also the lack of any hawkish surprises from Yellen on Friday. Moving on. The first day of the next round of Brexit talks kicked off yesterday and it didn’t go smoothly. EU’s chief negotiator Michael Barnier said he is “concerned” about the progress of the talks and urged the UK to start “negotiating seriously”. Barnier welcomed the UK government’s position papers but noted “we need UK papers that are clear in order to have constructive negotiations”. His mandate effectively means the UK has to reach an agreement of its share of the EU’s 2014-20 budget, the Irish border and EU citizen rights before discussing a future relationship with the EU. One EU diplomat said many countries were ready to wait until the end of the year for the divorce deal, rather than the early autumn as the British had hoped. Away from politics, yesterday we received the latest ECB CSPP data. As of August 25th, the ECB held €106.2bn which meant net purchases settled last week of €0.94bn. The average daily run rate was €188m which compares to a €348m average since the program started while the CSPP/PSPP ratio was 10.3% (versus previous weeks’ 9.6%, 11.4%, 12.8% and 6.1%). So another week of below average purchases but unsurprising in the context of the summer markets so not much to read into. With regards to the other remaining data yesterday. In the US, the August Dallas Fed manufacturing activity index was in line with expectations at 17. Within the details, the hiring index slipped modestly from last month’s 19-month high, but the capex index rose to its highest level since January. Elsewhere, the July wholesale inventories were slightly higher than expected at 0.4% mom (vs 0.3% expected), while retail inventories fell 0.2% mom. Over in Europe, the Eurozone’s July M3 money supply was modestly lower than expected at 4.5% (vs. 4.9% expected as per Bloomberg Cons). In Italy, the August consumer confidence index increased 3.9pts to 110.8 (vs 106.9 expected), which is the highest reading for this year. Manufacturing confidence was in line at 108.1, while the economic sentiment indicator strengthened to 107 (vs. 105.6 previous), the highest reading since November 2007. Looking at the day ahead, UK’s August Nationwide house price index (2.5% yoy expected) will be out in early morning, followed by Germany’s consumer confidence index (10.8 expected). Then France’s preliminary 2Q GDP stats (0.5% qoq and 1.8% yoy expected) and consumer spending for July are due. In the US, there is the Conference Board consumer confidence index for August and the June Case-Shiller house price indices. While we await Donald Trump’s response to the second consecutive North Korean provocation in four days, both on twitter and elsewhere, South Korean President Moon Jae-in has already ordered his troops to demonstrate their capability for “strong retaliation” and put on a show of “overwhelming force”, after his office convened a National Security Council session. According to Yonhap, President Moon ordered his country’s military to display its capabilities that can “overwhelm” North Korea should the communist state decide to attack, the presidential office The show of overwhelming force involved the dropping of eight Mark 84 or MK84 multipurpose bombs by four F15K fighter jets at a shooting range near the inter-Korean border in Taebaek, Moon’s chief press secretary, Yoon Young-chan, told reporters. “The NSC standing committee denounced North Korea for violating the U.N. Security Council resolutions by again launching ballistic missiles despite stern warnings,” Yoon told a press briefing. Yoon also said that in a telephone conversation that also took place shortly after the latest North Korean missile provocation, South Korean Foreign Minister Kang Kyung-wha and her U.S. counterpart Rex Tillerson agreed to push for additional sanctions by the U.N. Security Council. Futhermore, Gen. Jeong Kyeong-doo, chairman of South Korea’s Joint Chiefs of Staff, and his American counterpart Gen. Joseph Dunford agreed to take related measures at the earliest possible date, which apparently include the temporary dispatch of U.S. strategic assets like long-range bombers to Korea. Chung Eui-yong, Moon’s top security adviser, also held a telephone conversation with the White House’s National Security Adviser H.R. McMaster to discuss the allies’ joint measures against the North’s latest missile provocation. “McMaster said President Donald Trump fully supported President Moon’s North Korea policy and the South Korean government’s measures against North Korean provocations,” Yoon said. … while the Kospi VIX, along with most Asian stock vol indicators, spiked in early trading. Meanwhile, the Korean Won, which has become quite immune to Apocalyptic outcomes, sat near sessions lows, if well above where it was just ten days ago. Discussing the resilience of the South Korean currency, Koon How Heng, head of markets strategy at United Overseas Bank Group said the won is “failing to properly price in risks surrounding North Korea and trade talks with the U.S.” He added that “risk remains that KRW will weaken and lift USD/KRW back towards the top end of the trading range” although it remains to be seen just what event – clearly a North Korean violation of Japanese airspace is not quiet “it” – will be sufficient to dislodge the currency from its perch. Finally, in a curious tangent, while certainly not in Kim’s field of sight, Australian stocks just went negative for the year. US strategic weapons include B-1B strategic bombers, B-52 long-range nuclear bombers, stealth fighters, Aegis destroyers, and nuclear propulsion submarines. 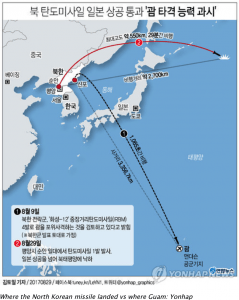 But not wanting to rely solely on Trump, Yonhap reports the release of the following 86-second-long video clip showing the test-firing of a 500-kilometer-range ballistic missile with improved warhead power and that of another one with a range of 800 km. The footage shows the missile being fired and accurately hitting mock targets on the ground and in the water. Ahead of tonight’s missile launch across Japan, North Korea warned that The UK “faces a miserable end” should it decide to join the joint military exercises being conducted by the US and South Korea that began last week, according to local media reports cited by Russia Today. The annual Ulchi Freedom Guardian drills, which have been conducted every year since the Korean War ended in an uneasy ceasefire, involve nearly 20,000 troops and have long provoked the ire of North Korea’s leaders. For its part, the UK hasn’t said anything about taking part in the drills. The UK could formally refuse a call to help the US fight a war against North Korea as long as North Korean leader Kim Jong Un doesn’t strike the US, according to RT. If Kim’s warheads were to strike US military bases in the Pacific, the US could ask for Britain’s assistance, but would be unable to compel the UK and other NATO allies to join in the fight against the North. Responding to the earlier missile launch, UK foreign secretary Boris Johnson said he is “outrgaed” by the “reckless provocation” of North Korea’s latest missile launch. The latest missile launch by North Korea on Tuesday will elevate tensions for some time, but it will be contained, writes Kwon Young Sun, a senior economist at Nomura International. Quoted by Bloomberg, Kown writes that Tuesday’s provocation has reignited market concerns just as tensions were seen easing through mid-August. As a result, “tensions between N.Korea and the U.S. reached levels unseen since 1994.” He adds that another spike is plausible, considering the military drill between the U.S. and S.Korea is still ongoing. Finally, he writes that the “probability for war ultimately breaking out on the Korean peninsula is about 35%”, although the number is most likely to change going forward. Following North Korea’s firing a ballistic missile across Japan overnight, China has warned that tensions on the Korean peninsula have reached the “tipping point” and urged all sides to avoid provocations. As ChannelNewsAsia reports, Foreign ministry spokeswoman Hua Chunying urged all sides to avoid provocations and repeated Beijing’s call for the North to suspend missile tests in return for a halt to US-South Korean military exercises. The situation is “now at a tipping point approaching a crisis. At the same time there is an opportunity to reopen peace talks,” Hua told a regular news briefing. “We hope relevant parties can consider how we can de-escalate the situation on the peninsula and realise peace and stability on the peninsula,” she added. Hua said the United States and South Korea “held one round after another of joint military exercises and they exerted military pressure on the DPRK (North Korea)”. “The facts have proven that pressure and sanctions cannot fundamentally solve the issue,” she said, referring to UN sanctions imposed against North Korea. China has backed the sanctions but also called for peace talks, but as Russia explains, sanctions pressure appears exhausted. As if this was not clear enough, Russia has also stepped up its rhetoric, with Reuters noting that a senior Russian lawmaker said on Tuesday that North Korea’s latest missile test shows its threat to fire four missiles into the waters near the U.S. Pacific territory of Guam was not a bluff. “Alas, Pyongyang has demonstrated that its threats to the U.S. base on Guam are not a bluff,” Konstantin Kosachev, chairman of the upper house of parliament’s international affairs committee, said on social media. Kosachev also said that a United Nations Security Council resolution regarding North Korea’s missile program which passed this month had failed to achieve its objective, “because the situation has turned into a bilateral standoff between North Korea and the United States”. “Regarding North Korea and the missile tests it is conducting, we stick to the resolutions of the U.N. Security Council and we insist on the fact that our North Korean neighbours should fully respect those resolutions,” Lavrov said. Finally, Russian Deputy Foreign Minister Ryabkov told reporters that while we can expect new sanctions pressure on the DPRK after the last launch, such pressure is exhausted..
As we noted at the time, Netanyahu’s brazen words to Putin that ‘preventative’ escalation in Syria to destroy what Israeli defense officials commonly call the “Iranian land bridge” (or the so-called ‘Shia crescent’) reveals increased desperation as even the West is now seeming to ignore Netanyahu’s repeatedly declared “red lines”. While Netanyahu’s public statements in Sochi were provocative enough – openly threatening direct military escalation in Syria should his demand for Iranian forces withdrawal not be met – the newly revealed threat of assassinating the sitting head of a sovereign U.N. member state takes the war of words to a whole new level. Israel warned Russia of dire consequences if Iran is allowed to continue on its current path in Syria. The Israeli Prime Minister also shared intelligence with Putin which purports to reveal Iranian plans for long-term presence in Syria. It appears Netanyahu is now making his case before world media, with new BBC and other international headlines reading, “Iran building missile factories in Syria and Lebanon: Netanyahu”. The prime minister, accompanied by Mossad head Yossi Cohen, the newly appointed head of the National Security Council, Meir Ben-Shabbat, and Likud minister Ze’ev Elkin who served as his translator, flew to Sochi on the Black Sea for the meeting, returning to Israel shortly after it ended. We further explained that Israel has long been at open war with Syria, in spite of the fact that both Israeli officials and international media rarely acknowledge it. In 2013 Israel launched a massive missile attack against a Syrian defense technology facility in Jamraya outside of Damascus. And yet more brazen was the 2016 attack targeting Damascus International Airport, which killed a well-known Hezbollah commander. In a significant admission earlier this month, the head of Israel’s air force acknowledged nearly one hundred IDF attacks on convoys inside Syria over the course of the past 5 years. While Israel has for years played more of a quiet ‘long game’ in Syria outside the media spotlight: providing tacit support to al-Qaeda terrorists in Syria along its Golan border (in Netanyahu’s words to Putin: Israel prefers the “Sunni sphere” over “bringing in Shi’ites” which reflects a disturbing widely held view among Israeli officials that ISIS is the ‘lesser evil’) as well semi-regularly bombing select targets, its increased willingness to loudly and unreservedly voice its intentions to the world is the result new realities it appears unprepared to accept. What new realities in the region are now pushing Israeli officials to incautiously leak threats of Assad’s assassination to the Arab press? First, the Syrian government and its allies Russia, Iran, and Hezbollah are winning the war. In Israel’s thinking the Astana agreement potentially means Iranian presence will now be backed by Russian air power. It also appears that in the United States’ backing of ‘de-escalation zones’ which necessarily involves Iranian enforcement, the US is giving tacit approval to Iranian troop presence in Syria. This is Israel’s worst nightmare: it invested so heavily in toppling Assad in the first place in order to roll back what it claims is ‘Iranian and pro-Shia expansion’ in the region. Secondly, the US has essentially signaled to Israel: you are on your own when it comes to Syria policy. Trump shut down the CIA program to topple Assad – a program which had the assistance of Israeli intelligence. Other world leaders like France’s Macron have further stated that Assad is here to say for the near future. Third, Hezbollah has just finished wiping up ISIS on the Lebanese-Syrian border and now appears more confident than ever. Israel went all in with the Sunni insurgency fighting Assad as that insurgency also threatened the existence of Hezbollah, which Israeli defense officials understand to be the most formidable foe right across Israel’s border. On Monday Hezbollah General Secretary Hassan Nasrallah declared August 28 as Lebanon’s “Second Day of Liberation” in a televised address celebrating Lebanon’s military victory over ISIS in the country’s northeast. As we reported recently, it’s an ‘open secret’ that US special forces advisers are indirectly coordinating with Hezbollah through the Lebanese Army, though politically sensitive as Lebanon depends heavily on US military aid. And finally, Israel senses that international opinion is shifting quickly now that ISIS is rapidly folding. It knows that world opinion will not stomach another Iraq style invasion for regime change in the Middle East. And yet such a prospect of regime change in Syria is now all the more difficult as Russian air defenses are so deeply entrenched. Israel now finds itself isolated and Netanyahu’s brazenness stems from this realization. His screams grow louder from a position of weakness. Now, the only question that remains is: on the remote chance that Israel does escalate militarily in Syria, what will Russia let it get away with? Saudi Arabia has, in recent years, shown a willingness to form more in-depth relationships with its main Asian customers, China, India and Japan. The Chinese energy demand, which is still the main driver of the global oil and gas market growth, is considered to be vital for Saudi Arabia’s future. The Kingdom is currently in a heavy battle with Russia and arguably Iran for the title of China’s biggest oil supplier, a title that Russia took from Saudi Arabia at the start of this year. Several analysts have been very worried about this development as it could weaken the IPO of Saudi Aramco. However, Aramco’s prominent position in the Chinese market, and the ongoing investments that the Saudi oil giant is making in downstream production and capabilities in China, will contain any negative repercussions from loss of market share. In the long-run, Aramco’s position in China will only strengthen, which will allow the Kingdom to lock in a hefty portion of its export volumes. The increased influence that China, in stark contrast to its historically inward-looking strategies, has gained in the Gulf region, Iran and the Horn of Africa, has been recognized in Riyadh.Saudi Arabia is aware that an economic relationship with such an influential country also increases security. China’s involvement and links with Saudi adversaries, such as Iran, Syria, or even Qatar, are seen as potential mitigating forces in a regional conflict. For Beijing, a stake in one of its main suppliers is a very attractive proposition. It will not only lock in Saudi crude oil and petroleum product exports to China but it will also provide some additional political and strategic clout in the heart of the Middle East. Aramco and the Saudi crown prince will be weighing their options.The attractiveness of having the Chinese onboard is clear, but providing China with too much influence in the region could spell trouble for the Saudis. Playing other investors, financial institutions and countries against each other is now the name of the game. HBO would be wise to have a real good look at the GCC adventures right now. A real Game of Thrones is now being played out, and while Aramco’s IPO may be the first battle, it will be far from the last. Early TUESDAY morning USA 10 year bond yield: 2.107% !!! DOWN 5 IN POINTS from MONDAY night in basis points and it is trading JUST BELOW resistance at 2.27-2.32%. The 30 yr bond yield 2.712, DOWN 4 IN BASIS POINTS from MONDAY night. 200 Point ramp in The Dow from overnight lows, but Nasdaq’s 90 point explosion is ridonculous! All options with respect to North Korea are on the table is the official response from Trump. The world has received North Korea’s latest message loud and clear: this regime has signaled contempt for its neighbors, for all members of the United Nations, and for minimum standards of acceptable international behavior. In other words, North Korea – and China – appear to have set a trap for the US president. Will Trump avoid the temptation to walk straight in it, or – in an attempt to “boost ratings” – will Trump do what Gens Kelly and McMaster are telling him to do? One more launch by North Korea may be all it takes to find the answer. While we are confident that both Trump and Kim would be delighted to just keep trading insults at each other for the indefinite future, even as North Korea launches the occasional ballistic missile, that time may be over. Speaking at the UN, the US Ambassador to the United Nations Nikki Haley said on Tuesday that North Korea’s launch of a missile over Japan was “absolutely unacceptable and irresponsible” and that the Security Council now needed to take serious action. “No country should have missiles flying over them like those 130 million people in Japan. It’s unacceptable,” Haley told reporters. North Korea has “violated every single U.N. Security Council resolution that we’ve had and so I think something serious has to happen,” she added, quoted by Reuters. Saying “enough is enough,” Haley said she hoped China and Russia would continue to work with the rest of the U.N. Security Council when it meets on Tuesday afternoon to discuss what more can be done about North Korea’s nuclear and missile programs. Of course, even if Russia and China do side with the rest of the Security Council as they did during the recent sanctions vote, it is unclear just what additional economic punishments and “harsh language” the UN can impose on the Kim regime to prevent him from doing what he has been merrily doing so far, oblivious of the consequences. The totality of the damage from Hurricane Harvey isn’t yet known, and as it continues to rain in Texas and Louisiana, it will likely be a few days before officials can start tallying up the damage but President Donald Trump has already promised Texans that he will swiftly pass an emergency funding bill to help offset what’s likely to be tens of billions of dollars in damages. But while Trump may hope that emergency funding is swiftly approved, Bloomberg points out that Congress has final say over the details of any relief bill. And lawmakers, who are not only facing a particularly hectic legislative calendar next month but don’t have the – let’s just say – best relationship with Trump these days, might not get the job done as quickly as the president would like. According to Bloomberg, conservative lawmakers could turn obstructionist unless the plan is offset by domestic spending cuts. While Trump said he’s already spoken with members of Congress, he has yet to submit a formal spending request for additional relief funds. Meanwhile, at least one Texas lawmaker has promised to add relief measures to a temporary spending bill that must be passed if Republicans want to avert a government shutdown after the current spending resolution expires on Sept. 30. However, Republicans haven’t said whether they will bring such a measure up for debate after Congress returns from its summer vacation. One option before Congress is to approve a “down payment request” on the cleanup effort in Texas as part of the spending bill, before passing a more comprehensive measure later. However, the administration hasn’t yet determined how much additional funding will be needed beyond what FEMA is already planning on spending. And with $3.3 billion in the bank, FEMA may have enough money in its disaster relief fund to start the cleanup effort, but nowhere near enough to finish it. Ironically, this time Democrats are alligned with Trump: Nancy Pelosi has already called on Democrats to support any Harvey related legislation… assuming it’s not tied to a bill that further restricts abortion rights, or funding for Trump’s border wall. However, with the storm expected to cause some $30 billion in damages, including the impact on the labor force, power grid, transportation and other elements that support the region’s energy sector, more relief funding will likely be necessary – and soon. Chuck Watson, a disaster modeler with Enki Research, said in an email Monday that Harvey could be one of the top eight hurricanes to ever strike the US. David Havens, an insurance analyst at Imperial Capital, said the final tally might be as high as $100 billion, a total that could potentially threaten insurers’ balance sheets. As of now, Harvey is on track to become the fourth most-expensive storm in US history, though this is based on an incomplete assessment of the damages. Amid desperate efforts to save stranded citizens – police report over 3,000 rescues alone – and the arrival of the so-called‘cajun navy’ to assist, Harvey continues to pummel Texas, paralyzing Houston as the region braces for yet more rain after the Tropical Storm recharged over warm waters and heading back in-land. “This is, if not the largest, it has to be categorized as one of the largest disasters America has ever faced,” Texas Gov. Greg Abbott declared at a press conference Monday afternoon. Houston’s main water-way, Buffalo Bayou, shows over 30 inches of rain and it’s about to get a lot worse. Buffalo Bayou is the main waterway that snakes through the heart of Houston, and the water levels of two reservoirs that feed into it are particularly concerning. Forecasters say Harvey will move slowly to the northeast throughout the week and shower some parts of the state with another 15 to 20 inches of rainfall by the end of Thursday. Additionally, The Post reports that certain areas to the west of Houston could see as much as 50 inches of rain by the time the storm is over — which would be the largest recorded total in Texas history. The death toll remains unclear. WSJ notes that on Monday evening, Mayor Sylvester Turner said three deaths in Houston had occurred during the storm but could not confirm reports that a family of six had died in their vehicle. Authorities said they fear the death toll will rise. Citizen rescuers also jumped in to help fellow residents, using private motor boats and even kayaks to ferry stranded people to safety as thousands poured into shelters around the state. With waters continuing to rise, some people panicked as they waited for rescue. FEMA officials said they expected to see at least 30,000 people show up to shelters by the end of the slow-moving storm. “It is imperative that we do everything possible to protect the lives and safety of people across the state of Texas as we continue to face the aftermath of this storm,” Gov. Abbott said. Levees at Columbia Lakes in Brazoria County have been breached, according to the official Brazoria County website. “Get out now,” the alert reads. Portions of Brazoria County, due south of Houston, had been under a mandatory evacuation notice since Sunday. this will wipe out maybe 3 million vehicles. Hurricane Harvey’s historic flooding in Texas is set to wreak havoc on the auto industry and its insurers with analysts now predicting the storm could damage more vehicles than Hurricane Katrina. In August 2005, Katrina wiped out some 500,000-600,000 vehicles but William Armstrong of CL King warns that Houston has about 5x more people than New Orleans did at the time. Hurricane Harvey could damage more vehicles than Hurricane Katrina, driving business to the salvage auctions operated by Copart and KAR Auction Services, CL King analyst William Armstrong wrote in a note. Katrina damaged 500,000-600,000 vehicles in August 2005, and the greater Houston MSA is five times as populous as pre-Katrina New Orleans. The cost of dealing with catastrophes can be higher than normal given vehicle extraction, towing and temporary storage and auction locations, though both companies have grown their physical presence in Texas over the last year, which should lower the need for temporary locations. It may be 2-3 months or longer until damaged vehicles are sold at auction. Of course, storms of this magnitude bring not only millions in salvage-related charge offs for the auto industry but a loss of critical “selling days” for one of the biggest markets in the country. As CNBC points out this morning, Citi analyst Itay Michaeli figures Hurricane Harvey could knock about 500,000 units off the August auto SAAR to be reported later this week. Citi analyst Itay Michaeli has cut his estimate for the rate of monthly auto sales in August, which are reported on Friday. He estimates Harvey will affect some 125 counties in Texas and about 60 percent of the state’s auto sales. “Our analysis suggests that Hurricane Harvey could push this down to the low-$16 million unit range,” Michaeli wrote in a note to clients. AutoNation’s 18 dealerships in the Houston area are shut down. Widespread flooding has not only swamped thousands of buildings in the Houston area, it’s likely damaged hundreds, perhaps thousands of new cars and trucks parked on dealership lots. Then, for the ‘less reputable’ used car dealers, no good crisis can be allowed to go to waste. As carfax points out, if previous hurricanes are any example, roughly half of the cars flooded by Hurricane Harvey will eventually be sold with no flood label to unsuspecting consumers. Of course, when the auto OEMs report abysmal sales this Friday they will undoubtedly also tell you how Hurricane Harvey is great for long-term sales because of all the salvaged cars that have to be replaced. Now authorities warn that bridges are not safe as they start to crumble to the weight of the floodwaters. As Tropical Storm Harvey heads back inland, slamming southwest Texas with another 15-25 inches of rain, Houston officials are reporting that the city’s critical infrastructure is starting to fail under the weight of the floodwaters, and may soon collapse. According to Reuters, roads and bridges in Houston have started to buckle under the impact of the catastrophic flooding in parts of the city. According to Jeff Linder of the Harris County Flood Control District, one bridge had collapsed and some roads had been damaged by the torrential rains. Worse, the damage is far from over. As reported yesterday, the water levels at two reservoirs to the west of the city, where more than 3,000 homes have been flooded, continue to rise. Meanwhile, Buffalo Bayou, the primary drainage system that runs through the city, is holding steady and may not recede for days, said Edmond Russo, deputy engineer with the US Army Corps of Engineers. According to USGS data, the Buffalo Bayou has recorded a record 33 inches of rain, and another 20 is expected in the coming 48 hours. Linder said the level of the Houston Ship Channel, which opens out into Galveston Bay was “at levels we’ve never seen before”, slowing the bayou’s ability to drain. Two major dams outside Houston have also begun to overflow, according to the BBC. Houston Mayor Sylvester Turner confirmed that one police officer has been killed since the flooding began. The Houston police chief says the officer’s body was recovered Tuesday morning. He apparently died when floodwaters overcame his vehicle as he tried to get to his post. Perez “died in trying.” RIP, sergeant. Houston thanks you and mourns all who have died in #HarveyFlood. Meanwhile, the Port of Houston is reporting that all facilities will remain closed on Wednesday, leaving oil tankers carrying an estimated 17 million barrels of crude oil stranded off shore with their cargo. All Port Houston facilities will remain closed on Wednesday, August 30th due to the weather impact accross Houston. At least nine people have died as a result of the flooding, including six members of one family. Finally, recall last night’s dire prediction by one engineer on twitter. If he is right, the dire forecast by Imperial Capital analyst David Havens who predicted that the final Harvey cost would surpass $100 billion, or 3 times more than what most believe the Harvey damages will amount to, will prove to be pleasantly optimistic in retrospect. Here’s one more example of how central banks’ global coordinated monetary stimulus in the wake of the financial crisis has increased systemic risk in the US: According to an analysis conducted by BlackRock, insurers are more vulnerable to a market downturn now than they were ten years ago. The reason? Ultra low interest rates have forced insurers to venture into markets with higher yielding assets, forcing them to stomach more risk along the way. Whereas insurers once tended to adhere to only the safest types of fixed-income products – typically highly rated government and corporate debt – they’re increasingly buying exposure to risky high yield and EM products, along with illiquid private equity funds, to try and boost their earnings back to pre-crisis levels. These products carry a potentially higher reward for insurers, but heightened risks are also omnipresent. In a downturn similar to the 2008 crisis, BlackRock estimates that US insurers’ holdings would drop by 11% – even more than they did during the crisis. Such a drop would be tantamount to $500 billion in losses. “The world’s largest money manager mined regulatory filings of more than 500 insurance companies and modeled their portfolios in a similar downturn. Their stockpiles – underpinning obligations to policyholders across the nation – would drop by 11 percent on average, according to its calculations. That’s significantly steeper, BlackRock estimates, than the group’s “mark-to-market” losses during the depths of the crisis. Which is a problem because, even though insurers claim they’re offsetting risk by “diversifying” into different types of risky assets, big losses can accrue if all of these assets were to drop at the same time – as one might expect during a “risk off” flight to quality. “The new diversity should provide a huge benefit, according to Buchwald. After all, it was concentrations of investments in mortgage-backed securities and certain equities that proved the biggest pitfalls during the crisis, a study by the Organization for Economic Co-operation and Development found. The BlackRock study was an attempt to market its new “Aladdin” analytics software. According to Bloomberg, the study has been published at an “interesting time” for markets. Mohamed El-Erian, chief economic adviser at German insurance conglomerate Allianz, warned that “non-banks” are increasingly reaching for high-yield bonds without regarding the risks. Some insurers, like Athene Holding, have bragged about the outsized returns from their riskiest investments. “Athene Holding Ltd., an insurer that leans on Apollo Global Management to oversee investments, is wagering on complex, hard-to-sell debt. Its alternatives portfolio, representing about 5 percent of total holdings, posted a 12.3 percent return on an annualized basis in the second quarter. When insurers invest in illiquid products like a private equity fund, they need to hold more capital on their books to offset the risk – money, that, as Bloomberg points out, “isn’t free.” After adjusting for the reverse capital, BlackRock found that the high-flying PE returns weren’t as spectacular as some insurers believed. “BlackRock’s study showed that the industry’s forays into alternative investments haven’t always delivered yields on par with what the underlying money managers project. Insurers have to hold large amounts of capital against the investments they make — money that isn’t free. When adjusting for those charges, private equity returns are generally less than 4 percent, whereas they would have been above 6 percent. “After experimentation with different assets, some insurers have shifted wagers. By the end of last year, the industry’s funds held in private equity had soared 56 percent to $56 billion from 2008. That trend is leveling off, Buchwald said. Real estate investments, meanwhile, hit a seven-year high in 2015, then dropped by $7 billion the next year to $42 billion. Hedge fund holdings spiked to $24 billion in 2015, only to drop to $18 billion the next year. MetLife and American International Group Inc. were among those that began changing strategies. Whatever their risk tolerance, a growing number of market strategists believe that the next sharp downturn in markets could begin as soon as this year. This would mark the first real test of insurers’ capital cushions since the crisis. And, particularly if it triggers a wave of defaults in the high-yield sector (or even among European sovereigns), a market rout could wipe out trillions of dollars worth of insurance company holdings. Let’s hope that – for their sake – when the other shoe drops, insurers are ready. With Republicans controlling the White House and both chambers of Congress, failing insurers likely won’t receive the same type of bailout that AIG did during the crisis.